Speed is of the essence when it comes to DNA analysis of plant breeding populations. This creates a demand for high-throughput DNA extractions from plant tissues, with resultant purified DNA of a suitable quality for PCR-based applications. The Genespin™ platform completes the nucleic acid extraction range and was engineered to fulfil the growing demands for the highest throughputs. It enables semi-automated but high- throughput DNA extractions from plant tissues, and utilises our proprietary Kleargene™ extraction chemistry. The Kleargene spin plates utilise a glass fibre solid support inserted into a microtitre plate, in 96- and 384-well formats. 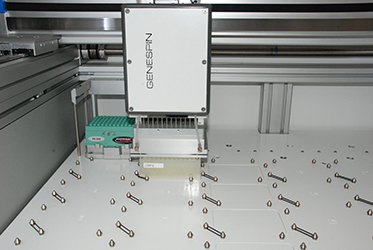 To guarantee a throughput of more than 5,000 extractions per day, the Genespin has been optimised to load the buffers into the spin columns without any cross-contamination. Kleargene kits are suitable for extractions between 100 ng and 5 µg DNA from plant material. In conjunction with our SNPline™, the Genespin platform provides DNA of a quality that is sufficient for downstream applications including PCR, SNP genotyping including KASP, and array technologies. Compatible with existing SNPline installations.